Cassidy Lam, from Bridgewater, Virginia, has been crowned the 2019 Virginia Dairy Princess. She was crowned on January 9, 2019 at the Natural Bridge Historic Hotel in Natural Bridge, Virginia. Mindi Freed from Timberville will serve as the Alternate Dairy Princess and Allison Bailey and Jessica Myers will serve as the Dairy Duchesses. Cassidy is the 16 year old daughter of Tom Lam and Terry Perotti. She has grown up on her father’s dairy farm and has been showing dairy cows since she was three years old. She showed the 2018 Youth Reserve Grand Champion Holstein at the Shenandoah Valley Holstein Show. Cassidy is a board member of the Virginia Junior Holstein Association and held offices with the Augusta 4-H Dairy Club. Cassidy is in the National Honor Society, is President of the Willing Workers 4-H Club, and is Captain of the Fort Defiance Marching Indians Color Guard. She has served as a Virginia Dairy Maid for eight years. As Dairy Princess, Cassidy would like to be “an approachable, knowledgeable figure dedicated to promoting the best interest of dairy farmers and the industry as a whole”. Joining the Dairy Princess Court this year as Alternate Princess is 16 year old Mindi Freed. She is daughter of Steve and Anna Freed. She works on a neighboring dairy farm and has been very active in 4-H and FFA. The purpose of the Virginia Dairy Princess Program is to promote the consumption and sale of dairy products to the consumer and to create better relations between urban and rural people through one on one contact at the local level. 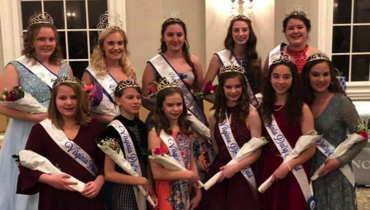 The Princess and her court, consisting of an Alternate, Duchesses and Dairy Maids, work throughout the year to accomplish the goals of the Virginia Dairy Princess Program. Activities range from school appearances to county fairs to industry sponsored dairy promotions. The Virginia Dairy Princess Program is open to young ladies between the ages of nine and twenty one years old and she must have ties to the dairy industry through family or 4-H / FFA. Contact us for more information or to book an appearance!